Let me say it outright: Rachel Green (played by Jennifer Aniston) is my least favorite character in FRIENDS. She is an epitome of the “basic girl” – dependent, materialistic, and a ‘run of the mill white girl’, at least according to Urban Dictionary. But my biased opinion of her character has slightly changed after seeing episode 14 of Season 7 (it took that long! ): “The One Where They All Turn Thirty“. Wait, before I tell you what made me change my mind about Rachel, allow me to appreciate Tag’s gesture when he was warning the gang that it was going to be a difficult day for Rachel. Pretty hilarious, right? But I digress. So what’s the biggest takeaway from this episode? 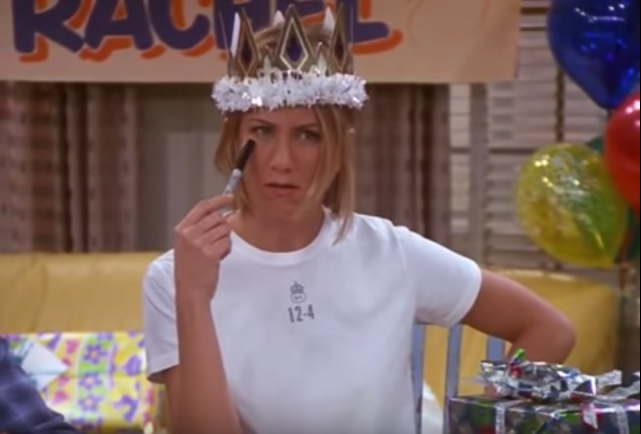 Besides the fun reminiscences of every FRIENDS cast’s 30th birthday, Rachel had an epiphany. First, she took a few moments to step back and give her life a good hard look. Then it dawned on her. What she needed was a plan. She figured she couldn’t waste more months nor years with her younger boyfriend, Tag, if she wanted (1) a serious relationship; (2) a wedding/marriage; and (3) a baby. Their gap wasn’t about youthful looks as Rachel managed to look young. It was more about priorities in life. It was a clear-cut “no” that they would ever meet half way even in three years or so. For women, age gap may not be the biggest deal. But it matters if the couple’s priority (or the woman’s goal) is ‘procreation’. I love that Rachel finally came to terms with Tag’s lack of maturity and her courage to walk away from a relationship that doesn’t truly meet her needs. Kudos, Rachel! You must have inspired a lot of women to make this bold move.